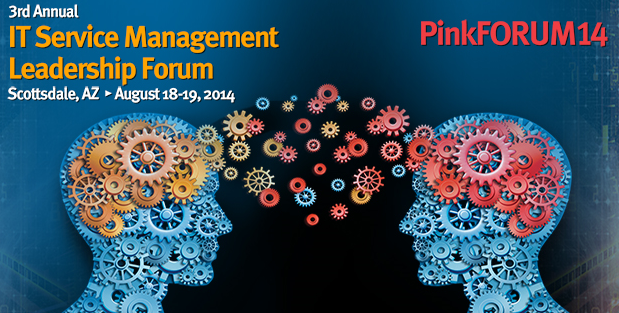 Over the past few days I had the good fortune to attend Pink Forum14. This was my first experience with a Pink event and I was impressed. Aside from the good balance of vendor representation there was an equally good sample of presenters who were able to fulfil the needs of the attendees. There was a great cross section of attendees who were looking for insights into game changers from not only a leadership perspective but from other service management functions which directly tie into driving continual service improvement initiatives. Personally I was able to connect with people who were experiencing similar operational challenges as well as where they had insights into areas of improvement which I may have not even considered. Having events like these are important but ensuring that there is some value add is paramount especially in these economic times where events and training expenditures are tightly scrutinized by organizations.